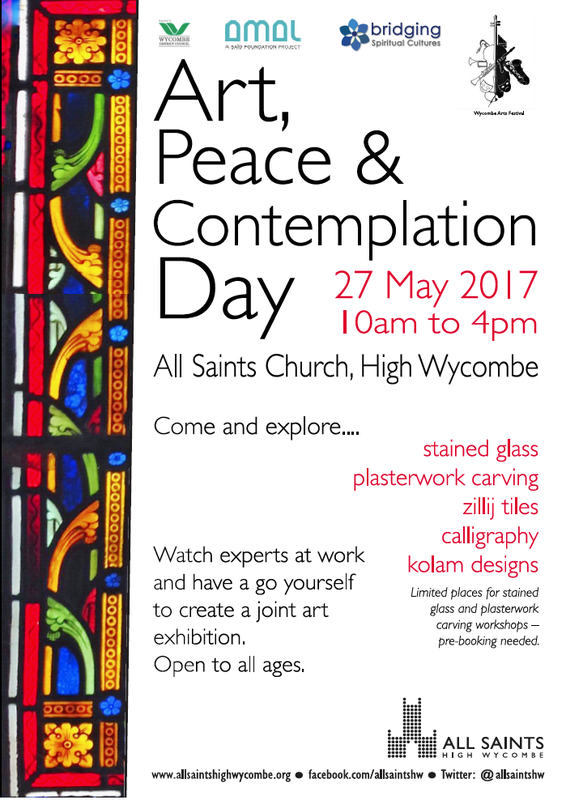 Bridging Spiritual Cultures and All Saints Church, High Wycombe is excited to announce that with generous support from Amal – A Said Foundation Project, and further support from Wycombe District Council through a community arts grant, we are hosting an Art, Peace and Contemplation Day (10am to 4pm) and Evening Viewing with Iftar and Music Event (7.30 to 10.30pm) at All Saints Church, High Wycombe as part of Wycombe Arts Week on Saturday 27th May. BSPC, All Saints and Amal share a vision of Arts and Culture as a way to build bridges between individuals and to strengthen community cohesion and inter-faith understanding. We also all believe in supporting artists in sharing their creative vision and passion especially amongst the young, show-casing talent from the entire community and especially those of under-represented ethnic groups. Daytime Art Experience: first day of Bucks Half -term and First Day of Ramadan! design can be shared, admired and you can even make your own! Plasterwork carving, tile-making, stained glass workshops and calligraphy are on offer and prebooking is recommended for the smaller workshops designed for young people and adults (plasterwork carving and stained glass working). Booking through All Saints email address office@allsaintshighwycombe.org). But for children or the young at heart you can just drop in to participate or even just to watch workshops of calligraphy or tile-making (£2 and £2.50 respectively) or South Asian Kollam design with the Women’s Cultural Arena (free)! Cafe and toilets on site. The ‘artists in residence’ for the day will be at work on large calligraphy wall hanging designs on linen and canvas representing the spiritual messages of the three Abrahamic Faiths through the Fatiha, Lord’s Prayer and Hebrew calligraphy. All these and the rest of the artworks will be displayed in the evening. Islamic Calligraphy is provided by Razwan Baig (http://www.islamicartofcalligraphy.com) and Christian calligraphy by Rev. Jenny Ellis. The Jewish calligrapher will be preparing a contribution on another day and displaying in the evening due to the Shabbat. From 7.30pm we shall be hosting an Evening Viewing of the art created on the day with an Oud recital with Farid Karam (Conservatoire of Lebanon) and Andalusian/Moroccan Sufi Singing with Safa, (a UK based community choir with additional singers from London and Paris). All washed down with Moroccan mint tea and a buffet of delights for refreshments and light Iftar after 9pm. Tickets are limited so pre-booking is highly recommended (adults and children above 10 years only, pre-booking required through office@allsaintshighwycombe.org or through info@bspc.org.uk).